For the second year in a row, the School of Public Health hosted the Fulbright Global Health Innovations Seminar, which brought nearly 90 international Fulbright Program students to the Georgia State campus in March 2018. Experts from Georgia State’s School of Public Health, Andrew Young School of Policy Studies and Office of International Initiatives lead sessions on topics such as analysis of public health data, community resilience and strategies to reduce health inequalities. Students also heard from three former directors of the Centers for Disease Control and Prevention, Drs. William Foege, David Satcher and Jeffrey Koplan. 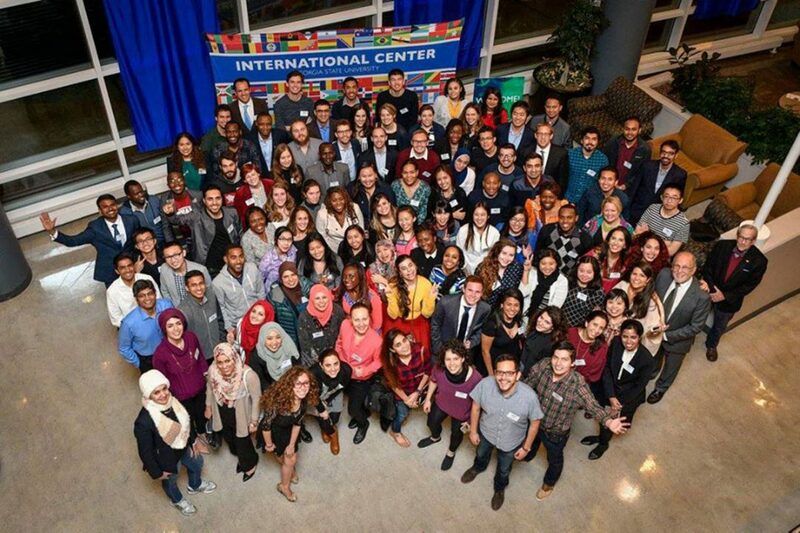 Participants were Fulbright foreign students from other countries studying in master’s or doctoral programs around the United States. The emphasis areas for the seminar included public health infrastructure, data and health disparities, and the public health/government relationship. The Fulbright Program is the flagship international exchange program sponsored by the U.S. government and is designed to increase mutual understanding between the people of the United States and the people of other countries. •Dr. Leandris Liburd, associate director for the Office of Minority Health and Health Equity at the Centers for Disease Control and Prevention, spoke about the important role storytelling plays in bolstering health equity. •Dr. Jeffrey Koplan is a former director of the Centers for Disease Control and Prevention and the co-founder of the International Association of National Public Health Institutes, spoke about the United Nations’ 17 sustainable development goals. •Dr. Bill Foege, former director of the Centers for Disease Control and Prevention and senior fellow at the Carter Center, offered 10 points of public health career and life advice during his presentation to the 2018 Fulbright Global Health Innovations Seminar. •Dr. Jan Nijman, distinguished university professor of geosciences at Georgia State University and founding director of the Urban Studies Institute, spoke about the intersection of urban development and public health worldwide. • Dr. Bill Foege, former director of the Centers for Disease Control and Prevention and Senior Fellow at the Carter Center, discussed the value of diversity and social justice in approaching global health solutions. • Dr. Jeffrey Koplan, former director of the Centers for Disease Control and Prevention and the co-founder of the International Association of National Public Health Institutes, spoke about the important work of national health institutes. • Dr. David Ross, president and CEO of The Task Force for Global Health, talked about the health disparities his organization addresses globally and in Georgia.